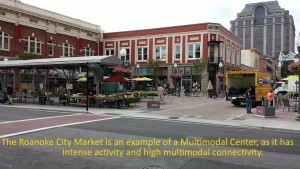 Multimodal District: A portion of a city or region with land use characteristics that support multimodal travel, such as higher densities and mixed uses, and where it is relatively easy to make trips without needing a car as gauged by the number of bus routes available, and safe walking or biking paths – either currently or proposed in the future. Multimodal Center: Compared to a multimodal district, a multimodal center is a smaller area of even higher multimodal connectivity and more intense activity, roughly equivalent to a 10-minute walk or a one-mile area. The combination of population and employment density per acre is described in the Multimodal Design Guidelines as activity density. Activity density can be used to identify multimodal centers and distinguish between land use intensities (urban to rural). The Roanoke region’s economy is greatly supported by the economic activity that occurs in multimodal centers and districts. Strengthening these areas, and connecting them with good transportation options bolsters the economy, allows for growth and the use of land more wisely, and creates numerous opportunities to move people and goods more efficiently. By pursuing transportation projects that aim to better connect regional multimodal centers and districts, as a planning tool, the multimodal centers and districts will continue to be useful in local and regional land use and transportation planning. The RVTPO has employed the use of the Multimodal Centers and Districts in its recently adopted Regional Pedestrian Vision Plan and will be incorporated in the upcoming Constrained Long-Range Multimodal Transportation Plan. This entry was posted in Transportation, Latest Updates on January 26, 2015 by Bryan Hill.